Synthetic cannabis (or synthetic marijuana) is one of the latest psychoactive substances distributed in Australia. It is designed to mimic or produce the same effects as cannabis, and has been sold online since 2004. With the rise of new drug testing kits, we now have a synthetic cannabis drug test for workplaces and clinics. Produced with man-made chemicals, synthetic cannabis is often used in powdered form, mixed with solvents, added to herbs and packaged in colourful packets. They may even be sold as aphrodisiac tea, herbal incense, and potpourri and sold openly in convenience stores, gas stations and head shops. The chemicals vary from batch to batch. They also fall under various brand names such as Kronic or K2, Spice, Kush, Mojo, Godfather, Northern Lights, and Lightning Gold. Similar to real cannabis, synthetic cannabis can cause dangerous side effects, especially in a workplace environment where safety is critical. However, “synthetic cannabinoids certainly have the potential to be significantly more dangerous than the natural plant material that they supposedly mimic,” says David Caldicott, an emergency medical doctor at the Australian National University in Canberra. Short-term effects of using synthetic cannabis include loss of control, lack of pain response, increased agitation, seizures, vomiting, profuse sweating, body spasms, elevated blood pressure, heart rate and palpitations. Being relatively new, the long term effects of the drug are not known. However, based on anecdotal evidence, it could result in organ failure, coma, stroke and possibly death. In Australia, the state governments are aware of the abuse of synthetic cannabis and are in the process of making synthetic cannabis illegal. Similarly, other countries are working to make the drug illegal. Get all the facts from the Synthetic Cannabis Legislation Fact Sheet. Can a drug test detect synthetic cannabis? Regular urine or saliva drug tests cannot detect the compounds in synthetic cannabis. This is because they can detect only the natural compounds of real cannabis. Luckily, there are now synthetic cannabis drug tests available that will identify these synthetics. One of the latest drug testing kits on the market able to do so is the K2 Quick View™ Synthetic Cannabis Urine Drug Test. This drug testing kit provides an accurate quantitative assessment of Synthetic Cannabis or K2 in human urine. It works by detecting JWH-018 pentanoic acid and JWH-073 butanoic acid. These are two of the most common synthetic cannabinoid/marijuana chemicals in herbal smoking blends. The drug testing kit needs just 3 drops of sample in the cassette in order to conduct a test. For employers and even parents wanting to test their kids, it is a fast and easy method to detect synthetic cannabis from a urine sample. Who is using synthetic cannabis? Synthetic cannabis attracts primarily teen users. However, adults may use it to try and get a ‘less detectable’ high. …mining, construction and other project workers are demanding Kronic because they think it is less likely to be detected in work-related blood tests than cannabis. Using synthetic cannabis may seem like a smart way to beat a regular drug test. However, compounds found in synthetic cannabis are extremely dangerous. One cannot truly compare their effects to their ‘natural’ counterpart. As the availability and popularity of synthetic cannabis increases, employers must decide on drug testing kits to use. 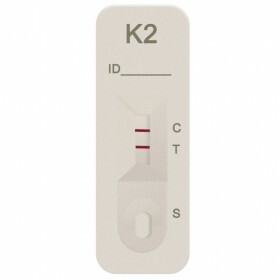 Drug testing kits such as the K2 Synthetic Cannabis Drug Test may be important in addition to routine drugs of abuse tests. Synthetic cannabis is banned, yet it is still easily available online and in stores. With synthetic drugs such as synthetic cannabis gaining popularity among the public, especially mining workers, and after the deaths of two men caused by synthetic cannabis earlier this year, it is only wise that employers and OH&S staff start paying attention to this dangerous substance and taking steps towards educating or preventing their employees from taking this drug. With the use of a synthetic cannabis drug test, employers can now accurately detect the new drug in suspected employees. Note: The K2 Synthetic Cannabis Drug Test is discontinued. Please take a look at our latest drug testing kits for more options.